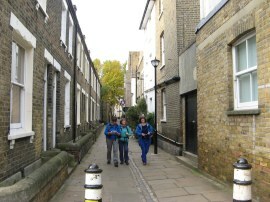 I did this walk on Sunday 30th October 2011. Making good use of the extra hour gained with the clocks going back I drove over to Slade Green station with Denise where we met up with Sara, Val and Chris. We then took the train over to Greenwich, a bargain £2 with an oyster card, to resume our walk for the final few miles along the Thames Path. From Greenwich station it was a 0.6 mile walk back down to the Cutty Sark Gardens where we had finished the previous stage, photo 1, and being a Sunday morning there were markedly less people about than when we were last here. From the gardens and their current building works we then headed down river to join the narrow stretch of path running past the front of the Old Royal Naval College, photo 2, one of the architectural highlights of the entire trip down the river. 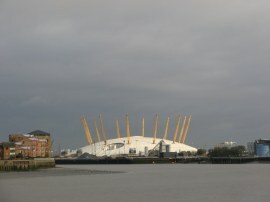 Ahead of us in the distance we could see the Millennium Dome rising above the river with its own rather different architectural charm, photo 3. 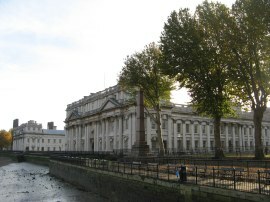 Reaching the end of the Naval College buildings the route heads to the right for a few yards besides the Trafalgar Pub, passing a statue of Nelson looking out over the river, before heading to the left along Crane Street, photo 4. Reaching the end of this short passageway the path continues ahead into High Bridge Wharf and back to the waterfront. 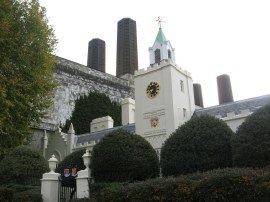 Here the route passes the old Trinity Hospital Almshouses, photo 5, now rather incongruously sited next to the Greenwich Power Station which is still occasionally used to provide back up power to the London Underground. Heading on, the route passes Ballast Quay and the bottom of Pelton Road and then along the front of some new flats before we reached a fence blocking the way ahead along waterside path. Behind this was the site of another new housing development and the Thames Path had to take a fairly significant detour before we were able to once again rejoin the river. At either end of the diversion there was a laminated sign attached to the fence showing the route of the diversion between Cadet Place and Bay Wharf although these had been attached to the wrong end of the path with the "You are here" at the opposite end of the path to where the sign was. As Chris remarked, they had a 50% chance of getting it right! The notice also stated that "We hope to re-open the path in November 2011 although this seems highly unlikely at present with only one day left to go when we went by. Leaving the river the path heads down the side of the new flats to join Banning Street, just below its junction with Pelton Road. We then headed left to the end of Banning Street, which now runs round into Christchurch Way. Here we again headed to the left before following Mauritius Road on the right which took us up to Blackwall Lane. 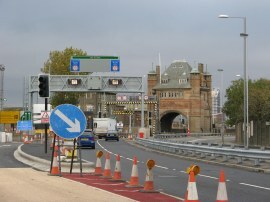 Here we headed to our left before bearing left again down Tunnel Avenue, the path soon running alongside the A102 Blackwall Tunnel Southern Approach Road. 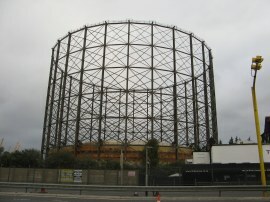 We followed the Tunnel Approach road past the large East Greenwich Gasholder, photo 6, almost as far as the Blackwall Tunnel entrance, photo 7, before we were able to leave the road. The path then heads down a fence lined path running through an industrial area, photo 8, which eventually leads back down to the river Thames. 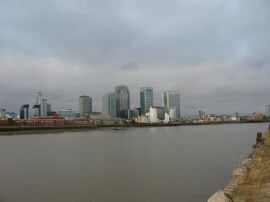 From the waterside there were good views back up the river towards Greenwich and also downstream over the broad sweep of the river towards the towers of Canary Wharf, photo 9. The path heads alongside the river through this area, past heaps of earth, sand and gravel lining the path before joining a slightly smarter section of waterfront running round the edge of the Millennium Dome although even this part of the path had seen better days. 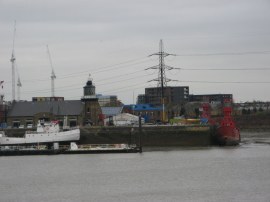 On the opposite bank of the river besides the mouth of the river Lea we could see the lighthouse, photo 10, at Trinity Quay Wharf which is London's only lighthouse, built in 1864. The lighthouse today is home to Longplayer, a one thousand year long musical composition which began playing at midnight on the 31st of December 1999, and will continue to play without repetition until the last moment of 2999. I visited it last year and the lighthouse is open to the public and it is possible to climb up to the top of the, all be it rather low, lighthouse. 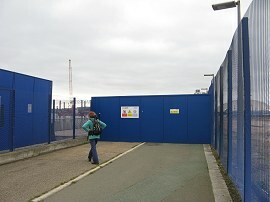 The path was followed around the edge of the Greenwich Peninsular as the river curves round the dome as far as the Millennium Pier where once again we were met by another section of hoarding blocking the path, photo 11, this time due to the construction of the London cable car. 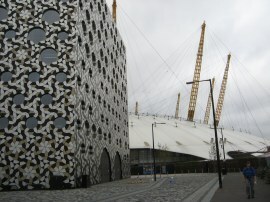 When complete this is due to carry people between the Millennium Dome and the Excel exhibition centre at the Royal Victoria Dock. There were no diversion signs present until we reached the end of the section however the alternative route, which headed up towards the dome and then to the left past some more new buildings belonging to Ravensbourne College, photo 12, and a large indoor football centre, was fairly logical and easy to follow. 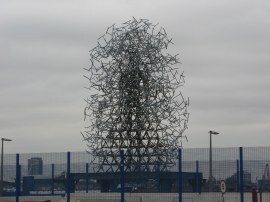 Reaching the end of the car park at the far side of the sports centre we were once again able to head back to the riverside, quite close to the Quantum Cloud, a sculpture by Antony Gormley, photo 13, for the final stretch of path down to the Thames Barrier. 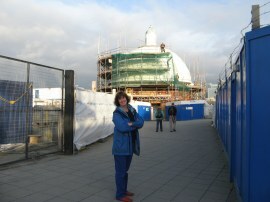 This headed down by more yet more new buildings where we gained our first views of the Thames Barrier. 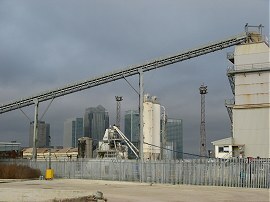 The path then heads by the Greenwich Ecology Park before skirting round the Greenwich Yacht club to reach another of the small remaining industrial areas of the part of the river. 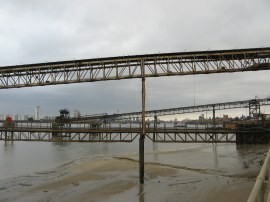 The route headed under a number of gantries stretching out to the river, photo 14, before joining a narrow road, Riverside, running along the bottom edge of the Meridian Trading Estate. On the ground we were still passing the glass markers in the pavement for the Jubilee Greenway which we first spotted by Westminster Bridge although this section was far from green. Rejoining the waterfront we then only had a few yards further to go until we reached the Thames Barrier itself, photo 15, and the end of the walk. Here there was one final diversion as the short section of path under the barrier buildings was closed, which was a shame as there is a mural on charting the course of the Thames on the wall which would have been nice to look at and recall our walk. 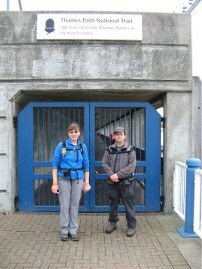 As it was we headed round the buildings and back down to the waterfront for one final photo under the sign marking the end of the path, photo 16. 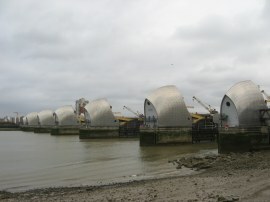 As usual I have uploaded the route of the walk which can be accessed here: Thames Path Stage 13 Route. Despite all the walking I do this is only the second National Trail that I have walked from end to end. I was very grateful to Sara for doing the walk with me as it made it far easier to accomplish, particularly in the rural areas down to Oxford which I would have had to of walked as a series of circular walks if on my own. As it is 13 walks over 8 months saw the path completed with no difficulties, watching the river gradually increase in size from a small stream near the start to the broad tidal river at the end on what had been a very pleasant and enjoyable walk. Of course there is still the northern section of the path between Teddington and Greenwich which I haven't walked and although this does not seem as attractive as the route along the south bank I may try and do some of this stretch as filler walks in the winter.